Midrange control. 15dB boost or cut of midrange at a center frequency of 330 Hz. On basses equipped with the ZP-2D, the midrange control is an internal trimmer on the circuit board. Turning the control clockwise boosts the mids. Turning the control counterclockwise cuts the mids. The midpoint in the control’s sweep is the “flat” position, zero boost or cut. (You will need to remove the control cavity’s cover plate to adjust this control.) 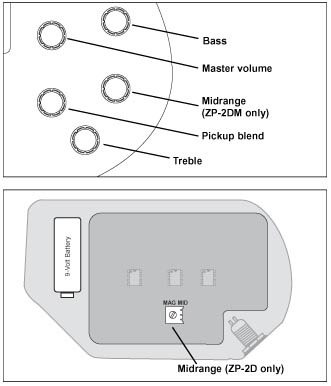 On basses equipped with the ZP-2DM, the midrange control is a knob on the instrument’s face. Turning the control clockwise boosts the mids. Turning the control counterclockwise cuts the mids. A detent, or “click,” in the center of the control is the “flat” position, zero boost or cut.